Age: 30 years to 32-Year-Old. Bangladesh Institute of Nuclear Agriculture Job Apply Online Processing at a Glance. 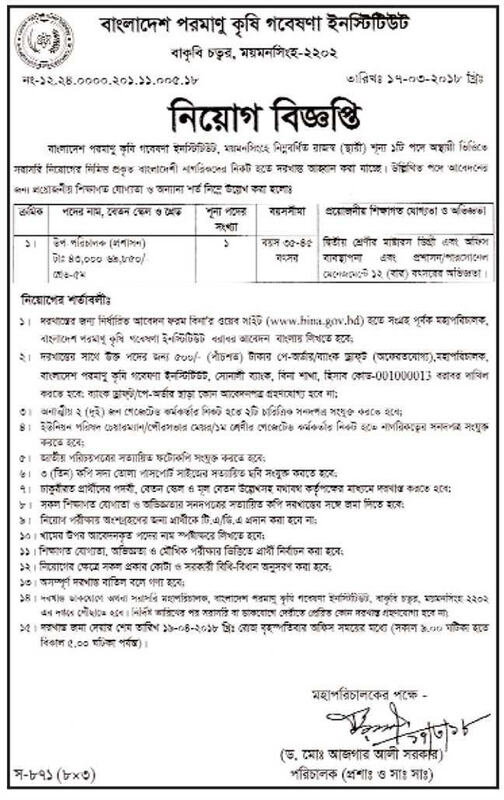 If you are interested to Submit Your CV on This Job Post Then You Have to Visit Bangladesh Institute of Nuclear Agriculture Job Official Website www.bina.gov.bd and Have to Click On Career Options and You have to Enter Your All Educational Information Example: Your SSC exam Passing Year, SSC Exam GPA, Exam Board Etc You Have Also Enter Your Father Name, Mather Name, Your City Name, Your Current Address, Your Post Office Name in a Word You Have to Enter Your All Educational And Personal information and Last Submit This Apply Form Carefully, Enter Your Job Experience if needed .Nationality ,Religion.Home Address, If You Have Any Quota Then Enter Your Quota, and Enter Your Email and Mobile Number You Have Also Enter Your Marital Status.If This Job Circular Demand Bank Draft Then You To Pay Apply Fees Via Bank which bank name they mention on job circular. BINA Job Apply Task Must Be Done very carefully. Thank You Very much for Visi Our Educations in bd Website. Always Stay with us.